Alright, I've just now packed and shipped IDV's submission to Fast Company's Innovation by Design Awards competition. 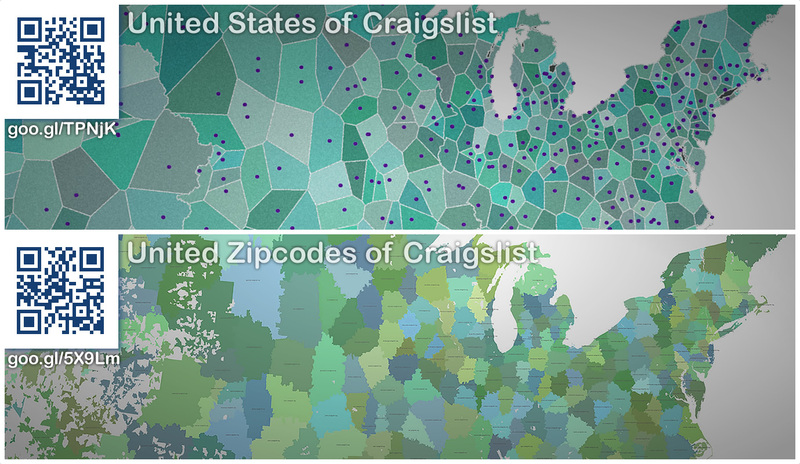 I submitted the United Zipcodes of Craigslist, which was FastCo's infographic of the day back in March. It was a zip-code agglomeration of the United States of Craigslist chalkboard map. The United Zipcodes of Craigslist came about as a follow-up resource for a preceding infographic, the United States of Craigslist. The project came about as a means of identifying practical economic zones irrespective of political boundaries. One clear source of persistent geographically localized economies is Craigslist. The “sites” defining the ecosystem and dispersion of the Craigslist online community are the location of a great deal of pragmatic peer-to-peer commerce, but are themselves only a named regional entity. How might these effective trade zones crisscross the United States? If I were to drop out of the sky and brush myself off, in which Craigslist tribe’s turf would I find myself? This was addressed in the initial “chalkboard” map visualization, the United States of Craigslist, within which the Voronoi method was used to grow purely digital boundaries around Craigslist “site” seeds. This map was released publicly and soon questions started coming in around more immediately useful formats of the results –most commonly requests for a list of US Postal Service zip-codes corresponding to each region. This was an opportunity to create the follow-up visualization, the United Zipcodes of Craigslist, which was featured as Fast Company’s March 5, 2012, Infographic of the Day (http://www.fastcodesign.com/1669120/america-charted-according-to-craigslist). This map assembles these socio-economic zones from the pile of zip-code area bricks (where zip-codes, and therefore residents, exist). What sorts of things can this, and other methods of constructing pragmatic economic zones, tell us? It gives us a regional framework that, while ethereal, is in many ways more meaningful than the sometimes arbitrary delineations of political boundaries. Over time these socially-constructed regions, and others like them, can and will shift, providing a fresh and scalable means of seeing and understanding communities.